There is a new (additional to what we now call "Selection mode") working mode, the "Grab mode", offering you rotation or shifting of your structure picture by grabbing an atom with the left mouse button, shifting the structure with the right mouse button pressed, or changing the enlargement factor with the mouse wheel. Doing this, you still have the choice to select objects. (Hold the Ctrl or Shift key when clicking an object.). So you need not switch between the normal selection mode and one of the different tracking modes, such as "Move/Rotation along x/y axes" etc. - although those modes are still available. You can use the mouse wheel button to activate a (semi-transparent) preview of the atoms and bonds (molecules, polyhedra, etc.) in the neighbourhood of the atom(s) under the mouse cursor. Use the mouse wheel to increase or decrease the preview search sphere. Use another click on the wheel button to take the preview into the picture. - Change the enlargement factor. - Zoom in/out or change perspective impression. - Change atom radii or thick bond tubes' radii. - Blow up polyhedra or coordination spheres, i.e. increase or decrease oordination number. 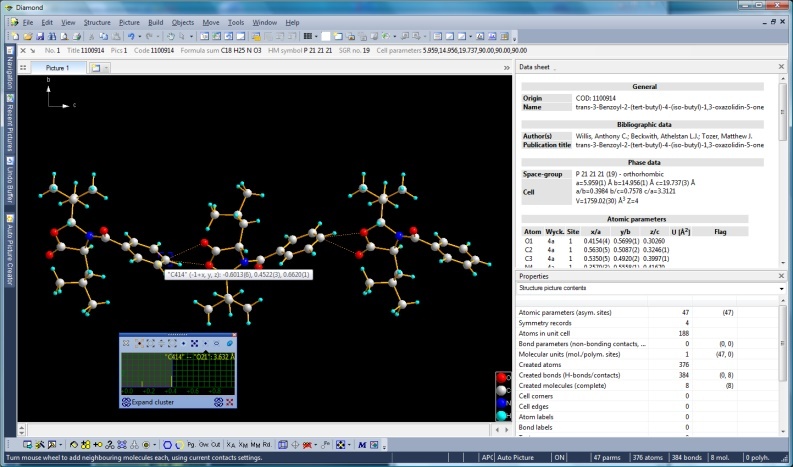 - Find contacts to neighbouring atoms or molecules. 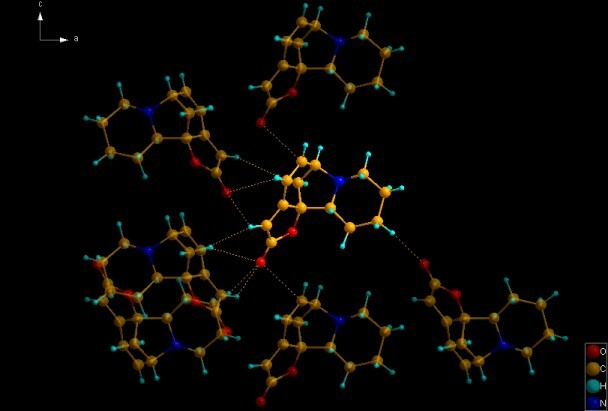 - Expand from one or some molecules to a bigger cluster of neighbouring molecules. The table of bond lengths and mean interatomic distances as well as the table of effective radii has been improved to gain better pre-defined bonding spheres for an imported structure. Besides this you can use the results of atom site enviroment researches (e.g. Dirichlet domains, see below) as basis for the bonding spheres. You can define the atomic environment of every atom site individually, because the method of bonding spheres may be too inexact and not consider different sites of a certain atom group. 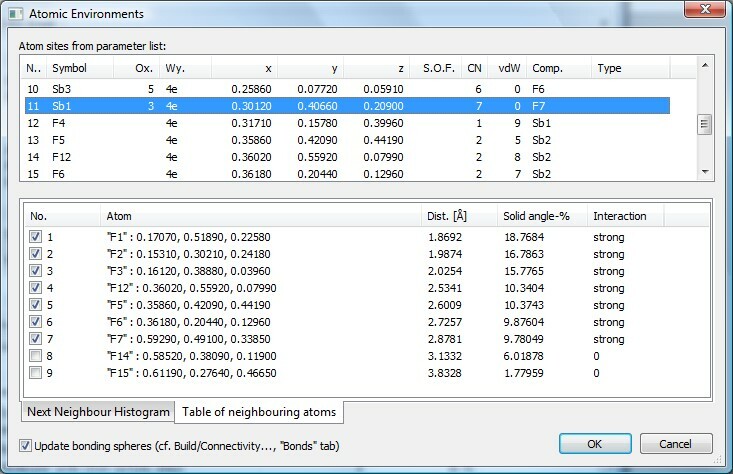 The atom site environments can be derived from calculations of their Dirichlet domains (Voronoi polyhedra). "Atomic environment" is available as additional option in many of the structure picture building commands that use (coordination) spheres or search for bonds. Structure picture drawing has been accelerated by adjusting the number of vertices to create a big or small atom bowl etc. to the individual situation. During rotation etc. of your structure, the vertex resolution can additionally (and optionally) be switched down. On the other hand, anti-aliasing can be used to reduce jagged lines. Having a structure picture with a lot of atoms and bonds as well as other objects such as labels, atom vectors etc. it may become a difficult task to catch a certain object by clicking it in the structure picture. Now Diamond offers a selection filter that enables e.g. to click a vector under a bond. Besides the normal selection mode, Diamond also offers additive and subtractive selection. So you need not hold the Ctrl or Shift key down when you [un]select a lot of objects in the structure picture.